Aggregate gain of $2.7 million in connection with the sale of Gulfport's equity interests in certain equity investments. Aggregate gain of $12.9 million in connection with Gulfport's equity interests in certain equity investments. 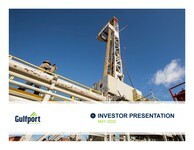 Aggregate gain of $124.8 million in connection with the sale of Gulfport's equity interests in certain equity investments. Aggregate gain of $35.3 million in connection with Gulfport's equity interests in certain equity investments. Gulfport’s net daily production for the third quarter of 2018 averaged approximately 1,427.5 MMcfe per day. For the third quarter of 2018, Gulfport’s net daily production mix was comprised of approximately 89% natural gas, 8% natural gas liquids ("NGL") and 3% oil. As of September 30, 2018, Gulfport's net debt-to-trailing twelve months EBITDA ratio was 2.1 times. For the nine-month period ended September 30, 2018, Gulfport’s drilling and completion ("D&C") capital expenditures totaled $638.1 million and non-D&C capital expenditures totaled $96.3 million. For 2018, Gulfport forecasts that its 2018 total capital expenditures will be at the high-end of the previously provided capital budget and expects total capital expenditures to be approximately $815 million. For the nine-month period ended September 30, 2018, Gulfport spud 19.6 net operated wells. The wells drilled during this period had an average lateral length of approximately 10,350 feet. Normalizing to an 8,000 foot lateral length, Gulfport's average drilling days from spud to rig release totaled approximately 19.5 days, in line with the Company's full year 2017 results. In addition, Gulfport turned-to-sales 28 net operated wells with an average stimulated lateral length of approximately 7,700 feet during the nine-month period ended September 30, 2018. During the third quarter of 2018, net production from Gulfport's SCOOP acreage averaged approximately 274.6 MMcfe per day, an increase of 11% over the second quarter of 2018 and an increase of 41% over the third quarter of 2017. For the nine-month period ended September 30, 2018, Gulfport spud 11.0 net operated wells. The wells drilled during this period had an average lateral length of approximately 8,100 feet. Normalizing to a 7,500 foot lateral length, Gulfport's average drilling days from spud to rig release totaled approximately 64.9 days, a 10% improvement from the Company's full year 2017 results. In addition, Gulfport turned-to-sales 12.6 net operated wells with an average stimulated lateral length of approximately 7,750 feet during the nine-month period ended September 30, 2018. Gulfport has hedged a portion of its expected production to lock in prices and returns that provide certainty of cash flow to execute on its capital plans. The table below sets forth the Company's hedging positions as of October 31, 2018. Gulfport's board of directors has authorized the Company to acquire up to $200 million of its outstanding common stock during 2018 and approximately $90 million remains under the current authorization. Purchases under the repurchase program may be made from time to time in open market or privately negotiated transactions, and will be subject to market conditions, applicable legal requirements, contractual obligations and other factors. The repurchase program does not require the Company to acquire any specific number of shares. The Company intends to purchase shares under the repurchase program opportunistically with available funds while maintaining sufficient liquidity to fund its 2018 capital development program. This repurchase program is authorized to extend through December 31, 2018 and may be suspended from time to time, modified, extended or discontinued by the board of directors at any time. EBITDA is a non-GAAP financial measure equal to net income, the most directly comparable GAAP financial measure, plus interest expense, income tax (benefit) expense, accretion expense and depreciation, depletion and amortization. Adjusted EBITDA is a non-GAAP financial measure equal to EBITDA less non-cash derivative loss (gain), litigation settlement, insurance proceeds, gain on sale of equity method investments and (income) loss from equity method investments. Cash flow from operating activities before changes in operating assets and liabilities is a non-GAAP financial measure equal to cash provided by operating activity before changes in operating assets and liabilities. Adjusted net income is a non-GAAP financial measure equal to pre-tax net income less non-cash derivative loss (gain), litigation settlement, insurance proceeds, gain on sale of equity method investments and (income) loss from equity method investments. The Company has presented EBITDA and adjusted EBITDA because it uses these measures as an integral part of its internal reporting to evaluate its performance and the performance of its senior management. These measures are considered important indicators of the operational strength of the Company's business and eliminate the uneven effect of considerable amounts of non-cash depletion, depreciation of tangible assets and amortization of certain intangible assets. A limitation of these measures, however, is that they do not reflect the periodic costs of certain capitalized tangible and intangible assets used in generating revenues in the Company's business. Management evaluates the costs of such tangible and intangible assets and the impact of related impairments through other financial measures, such as capital expenditures, investment spending and return on capital. Therefore, the Company believes that these measures provide useful information to its investors regarding its performance and overall results of operations. EBITDA, adjusted EBITDA, adjusted net income and cash flow from operating activities before changes in operating assets and liabilities are not intended to be performance measures that should be regarded as an alternative to, or more meaningful than, either net income as an indicator of operating performance or to cash flows from operating activities as a measure of liquidity. In addition, EBITDA, adjusted EBITDA, adjusted net income and cash flow from operating activities before changes in operating assets and liabilities are not intended to represent funds available for dividends, reinvestment or other discretionary uses, and should not be considered in isolation or as a substitute for measures of performance prepared in accordance with GAAP. The EBITDA, adjusted EBITDA, adjusted net income and cash flow from operating activities before changes in operating assets and liabilities presented in this press release may not be comparable to similarly titled measures presented by other companies, and may not be identical to corresponding measures used in the Company's various agreements.